Intel Rilis Ivy Bridge, sebuah prosesor dengan "Tri-Gate" Transistor. Berikut ini adalah berita yang dilansir oleh Pcmag.com atas peluncuran si Ivy Bride ini. Today's long-awaited introduction of Intel's Ivy Bridge processors was really only half an introduction; we met the quad-core chips, but not the promised dual-core versions. Still, it is important because it marks the first time that chips produced using 22nm process technology and using Intel's "tri-gate" 3D transistors are available to the public. The process technology matters in two main ways. The 3D or "tri-gate" transistors are important because they are the first significant move away from the planar transistors that have been used in the semiconductor industry for decades. With this technology, the gate wraps up and around a vertical channel through which current flows when the transistors are switched on. This should enable better performance at lower power than standard chips. Much of the industry has looked at this general concept—something often called FinFETs because of the way the design sticks up from the plane of the chip—but Intel seems to be years ahead in commercial production. (Similarly, the company introduced high-k/metal gate materials at the 45nm node for its Penryn design in 2007; GlobalFoundries didn't use the materials until last year with AMD's Llano design.) Mark Bohr, Intel senior fellow and director of process architecture and integration, said the company started working on 3D transistors back in 2001 and made the decision to go with the tri-gate design back in 2008, producing the first test Ivy Bridge wafers in November 2010. In addition, by moving to 22nm, Intel can demonstrate that Moore's Law—the concept that transistor density can double every two years as projected by Intel co-founder Gordon Moore—is alive and well, even if, in recent years, the way of doing that has moved from simple scaling to new techniques, ranging from "strained silicon" to high-k/metal gate to 3D transistors. (Here's my overview of the technology.) The new quad-core chip is said to incorporate 1.4 billion transistors on a die size of 160 mm2. Of course, this isn't the end of scaling; Intel has already started building factories for 14nm production, slated to start at the end of 2013. Indeed, at today's announcement, Bohr said that although the company would love to have extreme ultraviolet (EUV) lithography, it would be able to produce 14nm and even 10nm processors using current immersion lithography. Skaugen said the company has planned two more announcements in the next couple of months aimed at Ultrabooks and vPro, Intel's name for processors aimed at the enterprise market. I expect that means the dual-core variants, which I would assume will be manufactured in greater numbers as that's what makes up the bulk of mobile computers, will be formally announced in early June, at the annual Computex show. Details about this generation of chip have been slowly appearing since the announcement of the 22nm process almost a year ago. But there were some surprises. Skaugen said the new chip will have more than twice the average graphics and media performance of the existing Sandy Bridge processors. The chip will be available with two graphic variants, known as HD2500 and HD4000, and as part of the new design, not only have the graphics engines been redesigned, the number of engines in the high-end version has been increased from 12 to 16. It will have support for DirectX 11, Open CL 1.1, and Open GL 3.1. Later, Brad Heaney, program manager, IA Development Group, explained that the new chips have twice the number of graphics transistors and well as twice the performance of the previous version. Intel to describe this as a "tick +," as the chip includes both a shrink and architectural improvements. 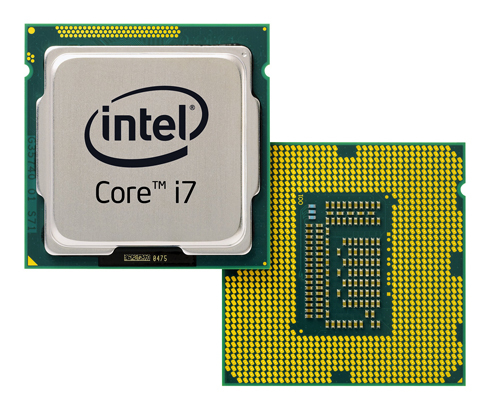 (Next year's chip, known as "Haswell" is supposed to be a traditional "tock," or architectural change.) Overall, Skaugen said the new processors will offer up to 20 percent more performance on multi-threaded applications while consuming 20 percent less power than Sandy Bridge. Bohr said that on a transistor level, each could produce up to 37 percent higher performance, while using 50 percent less power at the same performance. Other new features in the chips include support for USB 3.0 and Thunderbolt, for faster external connections; PCI Express 3.0, particularly useful for discrete graphics; Secure Key, an internal random-number generator for security applications; OS Guard, used to prevent some kinds of malware in Windows 8 and various Linux flavors; improved Anti-Theft Technology with remote lock and unlock features; faster Quick Sync Video; and improved Rapid Start, Smart Connect, and Smart Response technology for letting you quickly turn on your computer from a sleep state while nearly instantly refreshing your connections. It also includes a power control unit on board to control things like Intel's Turbo Boost that is itself equivalent to a 486 processor. Intel said its customers are working on more than 300 mobile products in development using the new chips and more than 270 desktop and all-in-one products. Of these, more than 65 are all-in-one designs and Skaugen went out of his way to highlight this as a new trend in the market. These chips are coming out a few months later than originally anticipated—the Sandy Bridge chips these will replace were announced in January 2011. Skaugen said this is "Intel's fastest ramp ever" and said the company has ramped production enough so there will be 50 percent more Ivy Bridge chips available in the market than there were Sandy Bridges in its first two months of production. However, he said, "demand is still outstripping supply." While saying that "yields are fine," Skaugen mentioned challenges in integrating the lower-voltage dual-core variants into the sub-18mm Ultrabooks Intel has been pushing. What this points to is a somewhat faster changeover in the top end models from Sandy Bridge to Ivy Bridge. This could be important, as the company will be starting a huge push for what it terms "Ultrabooks"—very thin, lightweight machines based on these chips. Meanwhile, though, AMD will be pushing its upcoming Trinity line of Fusion chips for mainstream laptops and "ultrathins" and the forthcoming release of Windows on ARM (or Windows RT, as it will be known) should allow for thin Windows notebooks running on ARM-based designs from Nvidia, Qualcomm, and Texas Instruments. Intel-based Ultrabooks are likely to sell for $699 and up, while generally you would expect ultrathins based on AMD processors to sell for $50 to $100 less than their Intel competitors and offer somewhat lower CPU performance but better integrated graphics. ARM-based Windows machines will be different in that they won't run the traditional "desktop" apps (except for Microsoft Office), and may not be as fast, but should offer notably better battery life. Here are the first reviews of the Ivy Bridge chips from PCMag, AnandTech, ExtremeTech, and Tech Report. All show better performance by the newer chip, as you would expect, if not really the 2X graphics performance quoted (more like 20 to 50 percent, depending on the game). In general, it looks like a good step forward for Intel integrated graphics, but Ivy Bridge still looks notably behind AMD's integrated Fusion A-series (Llano). The highest-end games still really want discrete graphics and I doubt that will change anytime soon but for casual gaming, it looks like a remarkable improvement. Of course, what I'm really waiting to see is how well this works on heavily-multithreaded business apps (which I hope to test shortly) and how well the dual-core version does in improving battery life.